I weigh 6 pounds, 6 ounces now. I'm learning how to breast feed and eat from a bottle but it's exhausting. Sometimes I get my milk through a special tube. The nurses say I'm doing great and won't need the tube much longer. I'm still using a little oxygen and pretty soon, I won't need it at all. I love long talks with Dad, snuggle time with Mom, and my burrito wrapper blankets. I think I'm going home soon and can NOT wait! 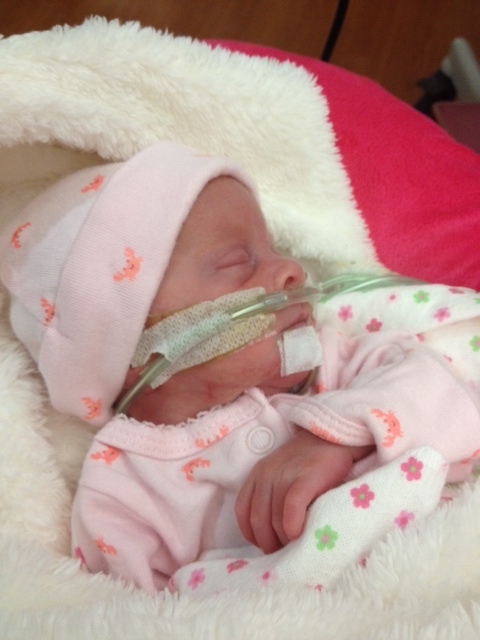 I was born on New Year's Day, 11 weeks early and weighed 2 pounds, 12 ounces. The first few weeks of my life have been scary for me and my family. I had bleeding in my brain but the doctors say that it's getting better and so am I :) I've been growing, I'm up to 3 and a half pounds. My big brothers, sister, and Mom & Dad can't wait for me to get home. I have to get bigger and stronger first so I'll stay in the NICU a little while longer.